API gravity express the gravity or density of crude oil and liquid petroleum products. API is devised jointly by the American Petroleum Institute and the NIST - National Institute of Standards and Technology. The measuring scale is calibrated in terms of degrees API. Density is a temperature depedent property. 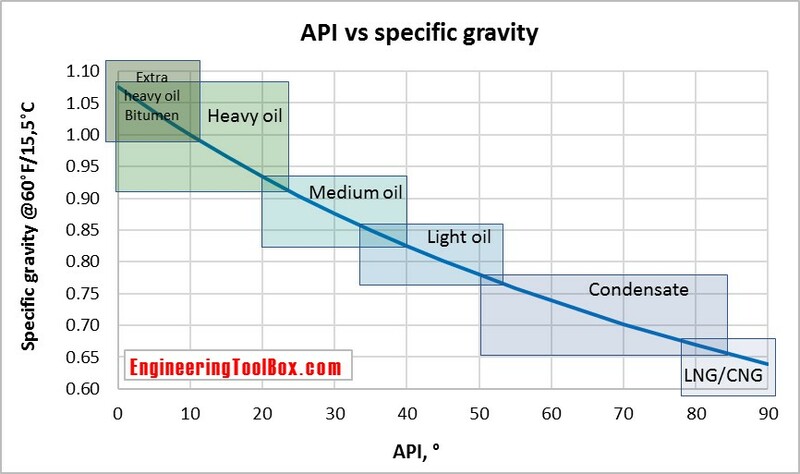 API gravity increases with increasing temperature, while specific gravity decreases with increasing temperature. See correlations at Density of crude oil as function of temperature. This means that the volume of a petroleum liquid increases with increasing temperature, and that a density number always must be given with the measurement temperature. The standard measuring temperature is 15°C or 60°F. See also Standard test methods (ASTM and others) for crude oil properties, and temperature correlations for lubricating oil, fuel oils and jet fuel. There is no clear definition of the different classes of crude oil; extra heavy oil (bitumen), heavy oil, medium oil, light oil, condensate. Different sources and different countries use their own limits. The boxes in the figure indicate the most common ranges used. Engineering ToolBox, (2007). API Gravity. [online] Available at: https://www.engineeringtoolbox.com/api-gravity-d_1212.html [Accessed Day Mo. Year].